From playing to the five senses to immersing us in virtual reality space, designers are creating a new, fuller experience, both in the built project and during design. When you think about being in a space, there are sensory influences that help you experience and remember that particular space or perhaps an associated memory. From an aroma to a texture to the light quality, these are design features that generate sensory relationships with our physical environment. Designers work to engage all our senses in the experience of a space or place. This requires incorporating numerous specialists and trades in the design process. A hotel may employ lavender to greet guests with a relaxing scent. The scent may be complimented by a blend of landscape architecture and entry way design elements. The purpose is to connect arrival with a relaxed environment and stress relief, subtly suggesting the hotel is a place to relax where a sense of well-being begins with your arrival. Environmental studies, such as observing the link between scent and mood, lead to a deeper understanding of how spaces and environments impact our feelings and responses. Blending architecture with other disciplines creates an enhanced experience. In workspace design, these studies and observations translate to designs that facilitate productivity and how workers interact with their environment. Understanding how people use their space and approach their work allows us to design environments with productivity, health and satisfaction in mind. In the past, designers would plan spaces around the number of people, type of work and a variety of amenities, and safety and access consideration. We did our best to understand and translate our knowledge into a two-dimensional world of drawings and plans. Today, Virtual Reality [VR] and Mixed Reality create three-dimensional digital worlds allowing clients to experience future spaces from inside the virtual model. VR takes us a long way to experiencing an environment prior to construction, but not all the way, yet. Touch and smell. The tech industry is on the borderline of integrating all the senses in a VR experience. Design firms in our A/E/C industry are currently creating spacial, lighting, color, and visual textures in our models with great success. Using natural light as a primary source of illumination is often a key goal. We can build a model that allows us to virtually walk around or sit in the space to experience the resulting daylight. We can even enable the model to demonstrate daylight throughout the day and seasons. Have you ever worked in your kitchen, home or restaurant, and wished you could move the stove here and move the fridge here? 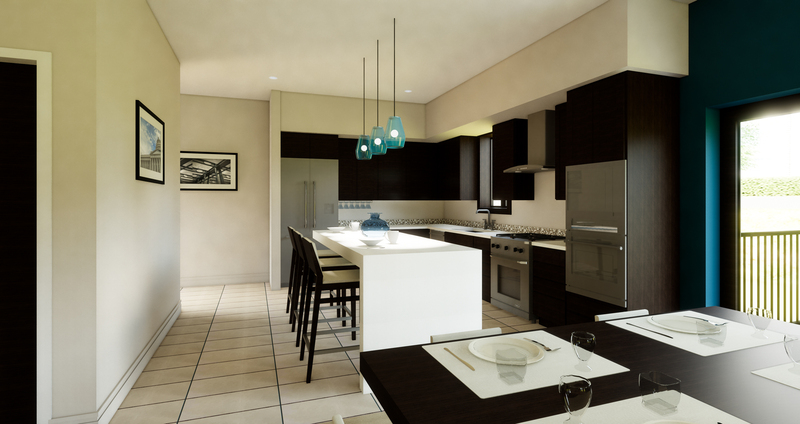 How great would it be to ‘walk around’ inside the kitchen before it is built and be sure it fits your personal needs? You might find the distance of fridge to counter or counter to oven is too far or crosses other traffic patterns. You might realize a particular cabinet and the fridge cannot be open at the same time. With VR the positional relationships of design elements and work patterns can be studied, adapted and virtually tested before final design begins. Understanding and experiencing a physical environment before it is built greatly benefits final outcomes. Whether only one or several decision makers are involved, alignment and satisfaction with the final project are increased. And though it is difficult to put a number to this intangible, we find our clients truly value the results. So how about the process, the steps to reach the built project? 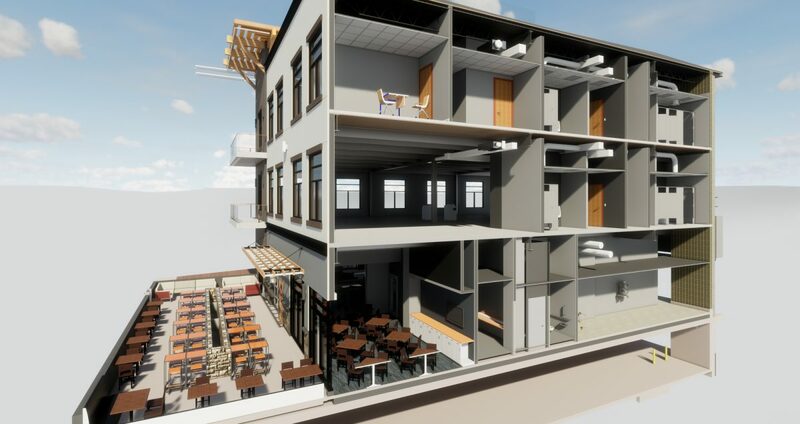 VR brings a number of benefits to a project: it can shorten total design with fewer iterations; clients will gain a better understanding of their decisions and make them more quickly; fewer design changes will be needed; material costs and budgets are clearer and more accurate; and, ultimately, expensive changes during construction are reduced. Indeed, these value-added benefits can be measured in both schedule and budget. As we come full circle, think of that imagined sequence: Step out of your car onto the cobblestone in the hotel porte cochere. Walk up a step onto the ochre sand-blasted concrete pathway lined with wooden planters of geraniums and tall grasses. Enter the doorway that automatically opens. Walk across a veined marble floor to be greeted by friendly, smiling staff. [We are counting on the proprietor to supply the staff.] Take a deep breath and enjoy the daylight streaming from ceiling to floor as you observe elegant and comfortable surroundings. Hopefully, you are thinking “Yes, I am on vacation!” Then take off the headset and realize it was a dream. Are you ready to make it a reality?